If you’re looking for a simple way to make an area of your home look more unique, having an accent wall can do exactly that. Using a bold colour, creating a collage of different photos, or having fun with other décor elements can add character to your wall and transform the look of your entire space. And the best part is, you can do this in any room of your home and change it up when you get tired of how it looks. Let’s explore some steps you can take to use accent walls that will help your space stand out and feel more inviting. Like an artist in need of a new canvas, you need to first figure out where you plan on setting up your accent wall. Choosing the right one plays a role in making your room look interesting. Selecting a wall that’s out of sight and bare of any architectural features can make your efforts fade into the background (and not in a good way) when it’s complete. Good options usually include the wall above a fireplace, behind the bed, or in the middle of the living room directly behind the couch. Simply put, stick to walls that are more centrally located in a room and already have some feature that draws your attention. Another aspect of your accent wall to plan for is the way it will be presented. Take a look at the space in question and ask yourself whether it will work. How does the natural light play with the room? Does it come in and bathe the space in sunlight? Or, perhaps you find that it’s pretty dimly lit during the day. Also, what about the placement of ceiling lights and lamps? Consider the way the wall is lit, day or night – you may find that a strip of small ceiling pot lights or up-lighting will bring out its vibrancy. What’s the Function of the Room? It’s relatively easy to turn any wall into an accent wall, but have you thought about the room that it’s in itself? For example, your kitchen may benefit more from warmer tones while your bedroom could look ultra-modern with some edgy-looking wallpaper. Consider the way you use the space in question and whether the ideas you have in mind will not only play nicely with it but also enhance its appearance. Making it more interesting is the easy part; the hard part is ensuring the overall design of the room looks great once all the elements are put together! Every room in your home has a different feel or atmosphere. For example, the kitchen is often the hub of activity but also made to be warm and inviting while the bedroom and bathroom are meant to be peaceful, serene spaces. Perhaps you’re converting a spare room into a home office and want an accent wall to make it feel more professional and modern. Or, maybe you want to make your living room feel more exciting and vibrant for movie nights. Regardless, considering the mood you want to achieve is an important step in refining your plans for a feature wall. Start to think about the design of the wall before jumping in. Remember, you want the wall to stand out, but not to the extent that it looks lost. Whatever you choose, it’s usually wise to stick with a bold or darker tone colour that relates to your surrounding wall colour to really captivate the eyes and work with the rest of the room. Think outside of the box when it comes to creating your accent walls. Instead of a standard colour, you could also create a striped wall, or use specialty paint like that with a metallic finish, which is becoming increasingly popular among designers. Wallpaper is another great option to consider for adding some fresh, unique design elements and patterns to the space. 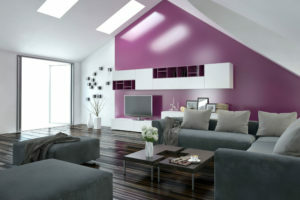 If you’re struggling to decide on what to put on your walls, look around at the accent features throughout your room. You can often get inspiration by picking up on your accent colours that are splashed throughout your cushions, rugs, and other décor pieces. This is a great way to find the perfect tone that will tie in nicely with your entire room. You can easily spice up the look of any room in your home and anchor a bare looking space by simply creating unique accent walls. They’re the perfect space to experiment with fun, bold colours, textures, patterns and more. At To Do-Done, our professionals can tackle just about any home project you need assistance with, including décor features like this. Give us a call and learn how we can help you!